For any of the cookers that I haul on a regular basis, I have made frame supports so I can stabilize and firmly tie down the cookers in/on the trailer. I have a set of two for each cooker model, one for each end. I like to strap the cookers down over the top, which when using these frame supports, makes the cookers a part of the trailer by solidly attaching them to the floor. The supports are made to fit tightly under the cookers and between the wheel assemblies, so when the cookers are strapped down, the frame supports carry all of the weight, instead of the wheel assemblies. This also removes all of the bounce and sway from the wheel assemblies while traveling. As a side note, I made all of these from the wood of the pallets the cookers came on. 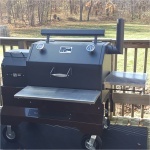 Yoder_Herb wrote: For any of the cookers that I haul on a regular basis, I have made frame supports so I can stabilize and firmly tie down the cookers in/on the trailer. I have a set of two for each cooker model, one for each end. I like to strap the cookers down over the top, which when using these frame supports, makes the cookers a part of the trailer by solidly attaching them to the floor. The supports are made to fit tightly under the cookers and between the wheel assemblies, so when the cookers are strapped down, the frame supports carry all of the weight, instead of the wheel assemblies. This also removes all of the bounce and sway from the wheel assemblies while traveling. As a side note, I made all of these from the wood of the pallets the cookers came on. We just bought a trailer for comps and I'm going to steal your design here. I was already planning to get some e-tracks but I'm going to make the supports like you did as well. Great Idea! You have any more pictures of your set up more more details. Did you actually tile the floors around your tracks? pretty interested. we are going to over time start building shelves, maybe sink, etc in ours. I put a 640 across the from and a 1500 down the center in my 6 x 10 trailer. I used cheap peel and stick tiles to do the floor. I took up the e-track and tiled to just under the edge where the track hit the floor, so the tiles do not go all the way under the e-track. It was easy this way as I did not have to cut tiles at all, just used full sized tiles. I ran grade 8 bolts through the e-track, through the floor and through the frame rails, with grade 8 lock washers and lock nuts on the bottom. There is a fastener in the e-track every foot, and every 2 feet the fasteners go directly through the frame rails under the floor. I made the cooker supports just a fraction of an inch taller so that I could put it under the cooker at a slant and then push the cooker and have the frame support lift the cooker a touch when it sits flat on the floor. Just remember to make sure that the load in the trailer is balanced side to side and front to back (which depends on your tongue weight requirements). If you put more weight on one side than the other, you are asking for trailering control issues and tire trouble. I am in need of a trailer to transport my YS640 that is on order. If I am transporting for Labor and Memorial Day and the 4th of July do you think I would need the additional supports. I'll be driving about 200 miles. Personally, I would say to always use them when transporting, but that is your decision. Yoder_Herb wrote: I put a 640 across the from and a 1500 down the center in my 6 x 10 trailer. What brand of 6 x 10 trailer did you buy? Did you order the drop axle? How difficult is it to push the units up the ramp? I think I want to get a 6 x 10 trailer but cannot figure out which trailer brand to buy. I want it custom painted to match my truck but it seems no one does that from the factory. IF they do it isn't advertised. Are there any options you'd recommend when you order a trailer new? I was considering an inverter so cooking without nearby 120v would be possible. I'd have to see where to get a 25' power cord for my YS640. Would you recommend the e-tracks be installed at factory or DIY? Do you find you need a lot of headroom? I was thinking of a reduced height enclosed so I can get it in our garage. I had my trailer made by AZ Trail Boss trailers in Tolleson Arizona. I bought a standard model from their Ranger models. Yes, my trailer has a drop axle. I push a 1500 up the ramp by myself. The best bet for color matching or graphics, is to look into vinyl trailer wraps. I had them put all LED lights on the trailer. I also had the same stone guard plate put around the entire trailer to match the height of the front included stone guard. I did have the trailer built with a battery tray, and wired for a battery, which I added myself. I had the factory put the e-tracks in, but I removed them to put down vinyl floor tiles, and when I put them back in, I put grade 8 bolts, nuts and fender washers in to hold the e-track in. The Ranger series had plenty of headroom at the rear ramp door to load even a Kingman Comp with fixed chimney. Howdy, can you provide dimensions on those supports? I am picking up a YS640 soon so I don't have it handy to measure. Mine will be different as they are made to sit over an e-track in my trailer. You should be fine for the short haul so you can measure for a tight fit. Makes sense, thanks. Tryin to bring my baby home safe I'll post some specs when I git'r'done this week. I recently bough. 640 on a comp cart. How exactly do you tie it down to your trailer? Where are the tie down points on the 640? I am getting ready to trailer my 640 800 miles to our new house in Ohio from Kansas. I want to make sure I don't have any issues. Alas, what exactly are the rings used for on the bottom of the cart? I thought these were supposed to be tie points? As shown in the first posts, I use straps over the top of the cookers attached to E-track on the floor. 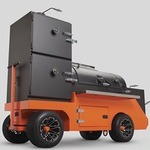 The reason I use the frame supports is to protect against damage to the wheels, tires and undercarriage, This also solidly attaches the cooker to the trailer, so that it can not move at all. The rings under the comp cart are tie down points. There are many way to tie the cooker to a trailer, there isn't any right way, so it is a personal choice on how you do it. Make sure to protect the cooker from moving forward or back, side to side, or bouncing up and down over rough roads. When hauling a cooker, you need to be concerned about movement of the cooker, i.e., up and down, forward and back and side to side. You also need to use properly rated straps to insure that in case of an accident, the straps do not fail and allow the cooker to become a missile/bomb. Remember that at highway speeds, the weight mass times the velocity of travel equals the actual weight the tie down straps need to support during an accident. Could you elaborate on how you actually place the stamps over the 640? My assumption is the straps, one forward facing and one rearward facing, are threaded through the counterbalance, since it is welded to the lid, and each end then attached to the e-track. Do you also tie the lid of the pellet box to keep it from bouncing? You are correct, but I always angle the straps forward and back so that the straps hold the cooker down on the frame supports, and also keep it from moving forward and backwards. Look at the pictures above of the 1500. I do the same with the 640, but with just 2 straps, instead of the 3 for the 1500, with one that goes directly over the top center of the cooker because of the added weight of the 1500. My trailer is enclosed, so I have never worried about the hopper lid, but if I was to haul on an open trailer, there is wind, so I probably would secure the hopper lid.